Technology and toddlers? Not two words we often put together. However, the use of assistive technology for infants and toddlers with developmental disabilities and delays can promote development, growth, and learning as well as family functioning. Assistive technology (AT) devices you might think of are wheelchairs, computers, or hearing aids, but many of us use AT devices daily. I personally wear corrective glasses, and I would be lost without the spell check on my computer. I would literally be lost without my GPS! Additionally, items that began as AT devices are now commonly used with all young children, such as large grip spoons, drinking straws, and Bumbo chairs. Assistive technology is any durable item, piece of equipment, or product system that is used to increase, maintain, or improve the functional capabilities of children with disabilities. These items may be purchased at the store, specially ordered, or made at home. Assistive technology includes devices and services. coordinating and using other therapies, interventions, or services with assistive technology devices. training or technical assistance for a child or a child’s family. training or technical assistance for professionals (IDEA 2004, Wright-slaw: Special Education Law). AT devices come in a wide range of technology levels. Low technology items may be things you can make at home by modifying materials you already have, such as using a rolled towel to support your child in his high chair. High technology items may be things you have made especially for your child, such as an electronic talker. Talk with your service coordinator and early intervention provider to see if your family would benefit from an AT evaluation. Many AT services and devices are included in early intervention services. Some may also be covered by your medical insurance. 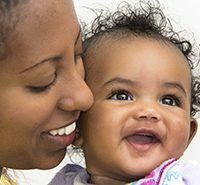 It is important to work with your early intervention professionals, medical providers, and other caregivers (e.g., child care providers) to find affordable and meaningful ways to incorporate AT into your child’s program and your family’s daily routines. 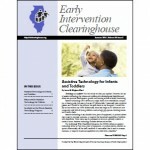 Early intervention services need to provide appropriate AT for children. This means they need to provide devices that assist the child and family in meeting their developmental goals but do not have to provide state-of-the-art devices. In car terms, they have to provide a Toyota, not a Lexus. If you prefer, the Lexus, your family will be responsible for funding that choice. Jenna M. Weglarz-Ward is a mother of four children ranging in age from 4 to 18 years old. She is completing her doctoral degree in early childhood special education at the University of Illinois. What is the Illinois Assistive Technology Program (IATP)? Demonstrate AT for people through trainings or our demonstration center. Loan an item out for families to do a “test drive” or if their device is being repaired. Connect people with vendors and funding sources. Loan qualified borrowers money to purchase AT. Help people recycle AT to other families who can use it through our used equipment program. What types of AT materials are available to families in EI? What are the most popular items for infants and toddlers? What if an item isn’t working right or it breaks? Any AT that we have for loan may be checked out by families. Our items range from simple daily living tools, such as pencil grips, up to complex and expensive communication systems. Adapted toys and switches used to activate toys are the most loaned items for EI. Instructions are provided with most items. If there is a question about an item, families can call us and we will try to troubleshoot, or we may refer families to the manufacturer for assistance. We try to work with families if an item breaks. We understand that things happen, especially with children. 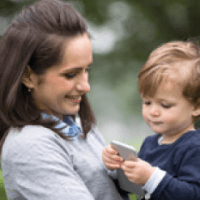 How do families access the IATP? Who is eligible to borrow from IATP? Is there a loan period? How do patrons return items? Is there a fee? Please visit our website (www.iltech.org) or reach us by phone at (800) 852-5110. The only requirement is that the borrower lives in Illinois. We often loan items to families, therapists, and teachers. The loan period for devices is five weeks. Patrons can return items either by mail or UPS, or they may drop them off at our office in Springfield. The only cost to families is the cost of returning the item; we pay for shipping to the borrower, and they pay for shipping back to us.